Last week we had our first hint of fall here in Southern California. Temperatures dropped from the high 90s and we were blessed with several cool days. I struggle to cook in the summer months because it’s just so darned hot in my little house without air conditioning. And I sure do get bored eating salad at every meal! As soon as I felt a cool in the air, I delighted in baking chocolate chip cookies and made a delicious pot roast in the Dutch oven. 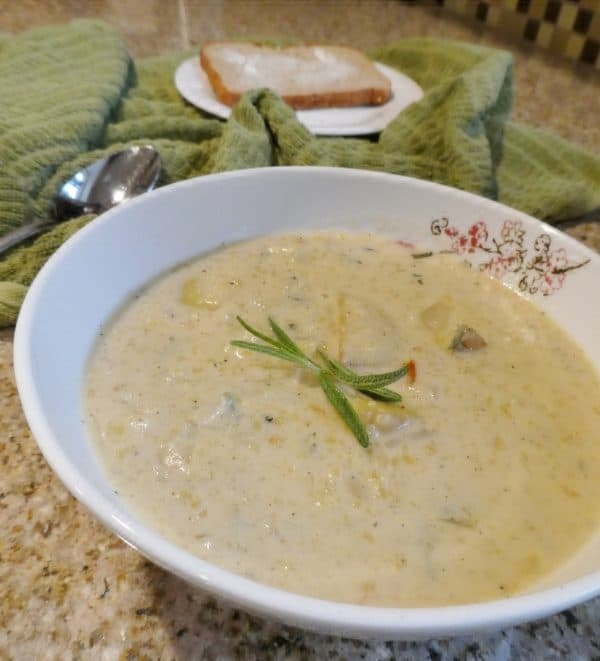 I also made a family favorite, my roasted garlic and rosemary potato soup recipe. I’ve been making this soup for years, much to the delight of my family. 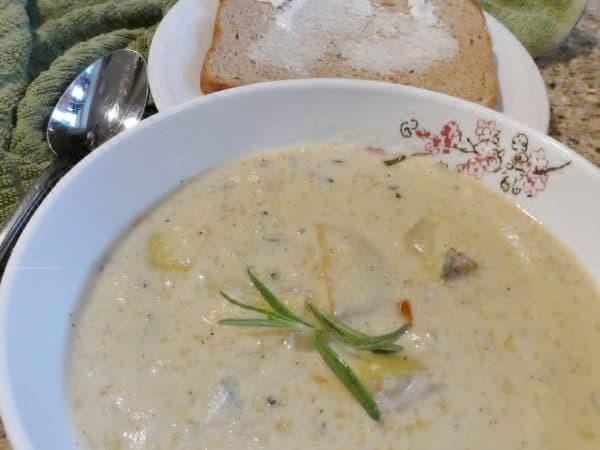 I like that I can prepare the potatoes ahead of time and then put together the soup quickly for dinner.This soup is appropriately creamy and flavorful with a wholesome thickness but without the guilt that creamy soups usually have. You know, like tons of butter and cream? Not here! Check out that beautiful garlic clove, pure heaven! No butter or heavy cream in this one, just a little bit of half and half. 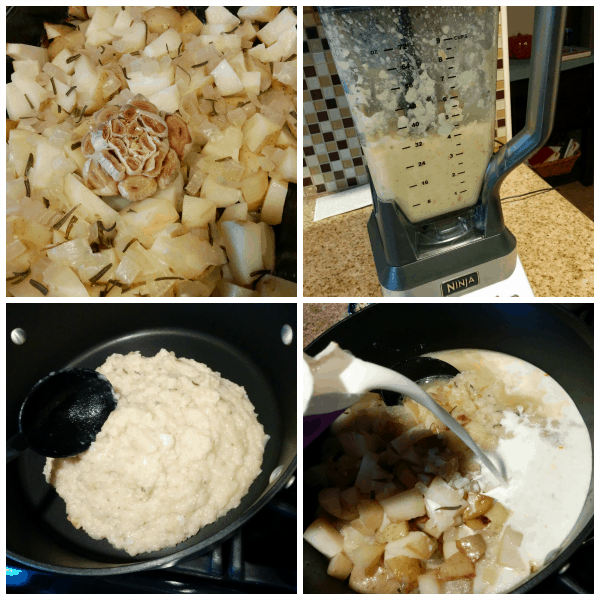 The thickness comes from the potatoes themselves, pureed into the base inside your blender. Couldn’t be easier! And if you wanted to make it even more of a healthy dish, you could replace the half and half with milk instead. 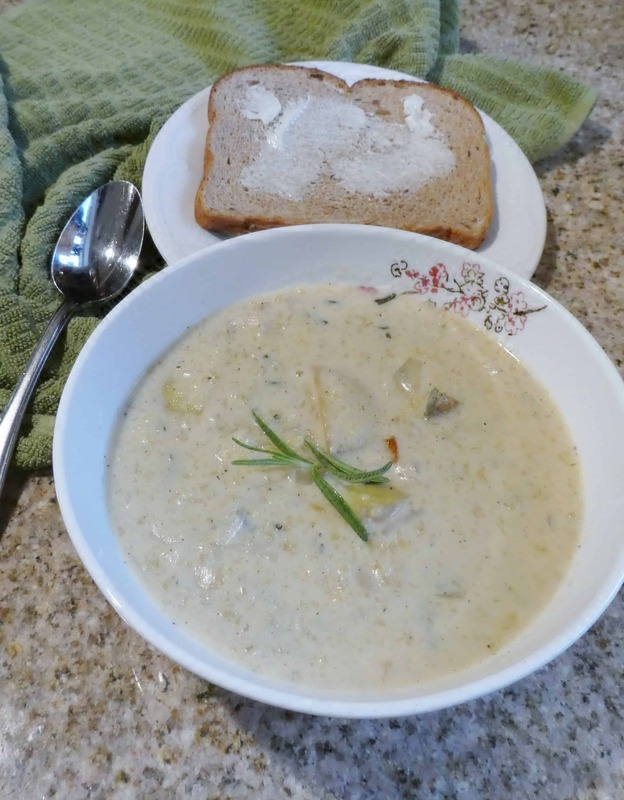 This soup is wonderful served as a meal of its own or alongside a fresh green salad, turkey sandwich or just a piece of buttered bread (that’s how I had it!) We had a small amount left over for lunch the next day so I warmed it back up in a pot with a drizzle of milk to thin it and it reheated back up nicely. 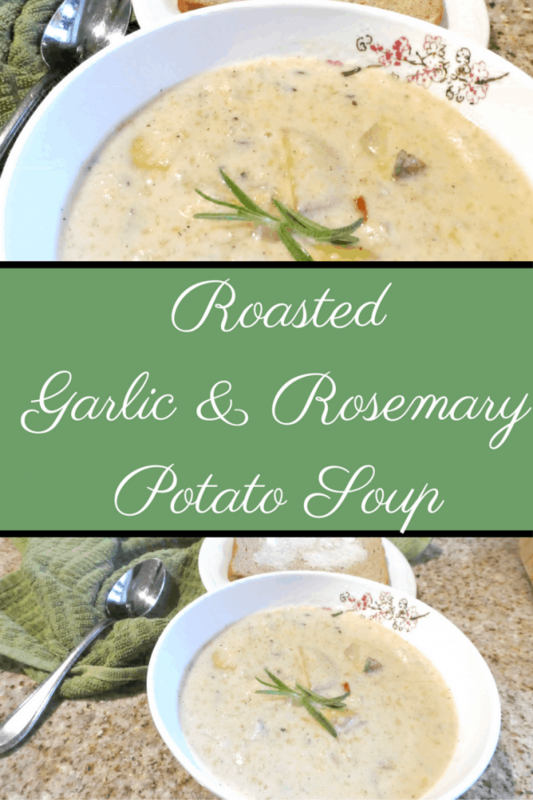 Mmmm, such a warm and cozy fall meal, I think you’ll love my Roasted Garlic and Rosemary Potato Soup Recipe! Peel and cube three of the potatoes and place on one side of a 9" x 2" pan. Cube the remaining three potatoes with the skin on and place those on the other side of the pan (peeled potatoes on one side, unpeeled on the other). 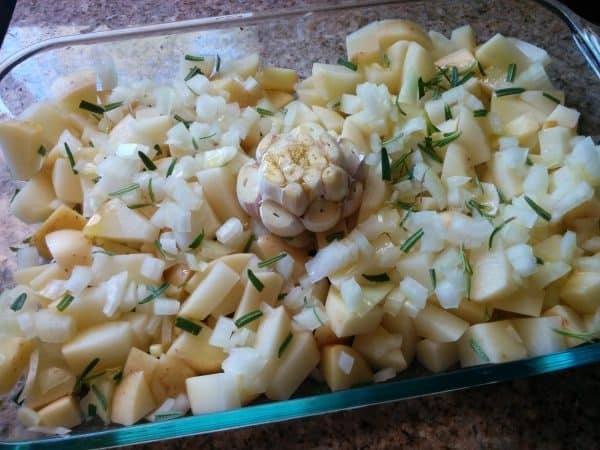 Sprinkle chopped onion and snipped rosemary across the top of the potatoes. Peel off the dry outsides on the garlic bulb. Cut across the top, leaving the bulb intact but exposing the cloves. Place upright in the center of the pan. Drizzle oil across the top of garlic and potatoes. Cover with aluminum foil and bake for 50 minutes. Set aside to fully cool. 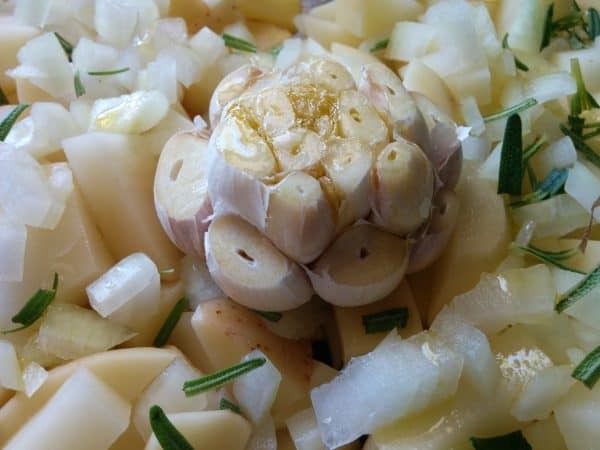 Squeeze the garlic paste from the bulbs into a high-powered blender. Add peeled potatoes, half the onion, half the broth and all of the flour and pepper into the blender. Pour into a medium saucepan and add in unpeeled potatoes, rest of onion and broth. Add half and half. Cook until bubbly and warm.